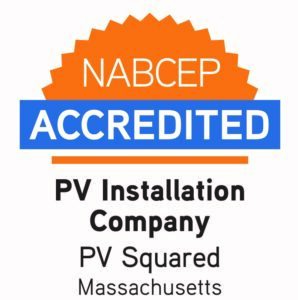 In 2017, PV Squared received Company Accreditation by the North American Board of Certified Energy Practitioners (NABCEP). We are one of ten NABCEP Accredited companies in the United States, the first company located in New England, and the only one based in Massachusetts. So what does that mean and why does it matter? NABCEP Company Accreditation is the highest recognition of quality assurance for solar installation companies in the US. That means you can count on us to deliver an exceptional experience throughout every stage of the project process- starting from your first conversation with PV Squared and continuing years after your solar array is installed. In order to become NABCEP Accredited, companies must meet and maintain a rigorous set of standards around installation, employee training and qualification, safe work practices, and customer accountability. We’re proud to be NABCEP Company Accredited, but it isn’t the only example of excellent practices that we’ve achieved. If you’d like to learn more about verification of our sustainable and ethical business practices, read our blog post about our values and why we pursued B Corp Certification over three years ago. We’re also a member of the Better Business Bureau (BBB) and local Chambers of Commerce, and have been voted the Best Solar Installation Company in the Pioneer Valley two years in a row! So, rest assured, you’re in good hands. If you have any questions about NABCEP Accreditation or solar in general, feel free to give us a call at 413-772-8788 or send us an email at pooc.1555715476derau1555715476qsvp@1555715476ofni1555715476.